In their respective expansion, the Roman and Chinese empires each absorbed many neighbors with distinctive cultures, which submerged. 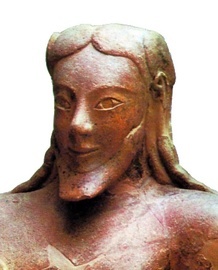 The Etruscans were close neighbors from whom the Romans owed much. The people whose sacrificial statues astonished archeologists had long disappeared when Qin annexed Sichuan. Left: Detail of a painted terracotta lid of a sarcophagus from an Etruscan tomb at Tarquinia. C 550 BCE. 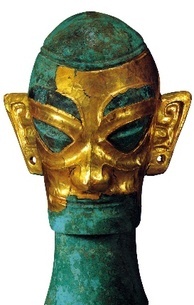 Bronze statues found in two sacrificial pits inSanxingdui, Sichuan. Shang Dynasty, c 1200 BCE. The Roman and Han Empires coexisted with the Parthian and Kushan Empires. 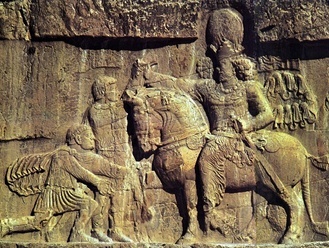 The Parthians and Kushans were semi-nomads. Few of their images survived. 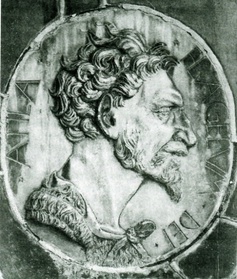 A Parthian ruler. Found in Mesopotamia. 2. The Kushan kiing Kanishka. 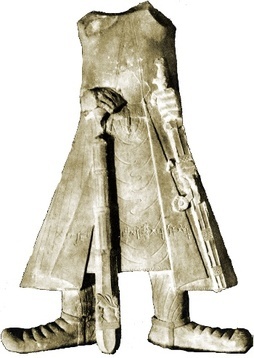 The Kushan king Kanishka, who reigned around 128 or 144. Red sandstone, Museum of Archeology, Mathura, India. The major neighbors to the Roman Empire were the Germans to the north and Parthians/Persians to the east. In comparing with China, however, the Huns leap to mind first. These nomads were unknown to the west before 376, and their influence lasted less than a century. They were small in number; scholars reckon around 15,000 mounted warriors in total. Their success depended on their ability to unite the Germans they defeated and lead them against the Roman Empire. Speculations exist that the Huns were somehow related to the Xiongnu, whom the Sogdians called “Hun” in 313. The Xiongnu united the steppe nomads and extorted tributes from the Han Empire. After a century-long struggle, the Han defeated the Xiongnu, who disappeared from Chinese records after 151. Were the Huns descendants of theXiongnu who moved west? Evidence for and against it are both scarce. Bronze statues of the warring-states period, before the steppe nomads united under the Xiongnu. 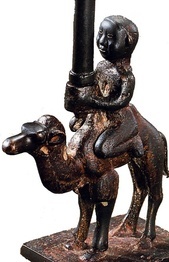 Their round face, high cheekbones, hair style, dress, and the camel, all indicate peoples of the north. (Left: Museum of Fine Arts, Boston. Right: Base of an oil lamp, Hubei Provincial Museum). 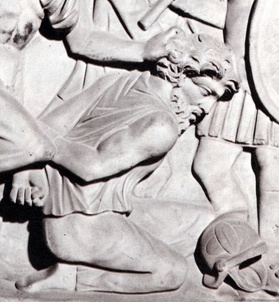 Barbarian captive, from a Roman sarcophagus. The thick hair and baggy trousers were characteristic depictions of Germanic peoples. (First-second century, National Museum, Rome). 6. A nomad in Han times. A servant supporting an oil lamp. The facial feature and pointed hat indicate him to be not a Han-Chinese, but perhaps a Xiongnu. 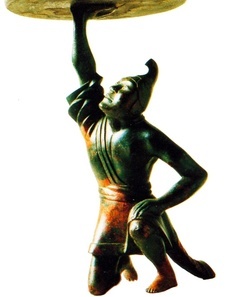 Former Han Dynasty bronze. (Cultural Relics Publishing House, Beijing). 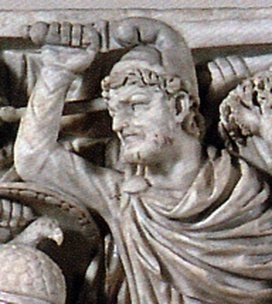 Details of the Ludovisi sarcophagus relief showing an Asiatic warrior with the customary pointed hat. Mid third century. 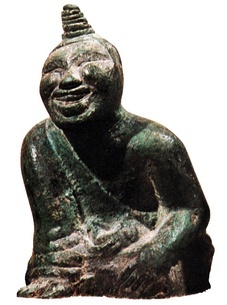 Bronze statue of a laughing nomad of the north with bared shoulder. Early Han tomb figures. (The AveryBrundage Collection). 9. Roman emperor kneeling to Persian king. Triumph of the Persian King Shapur I over two Roman emperors. Valerian was captured. Philip, portrayed kneeling, escaped by paying a large tribute. Sassanianrelief on the tomb of Darius, Naqsh-i-Rustam. 10. A maid from the Dian Kingdom. 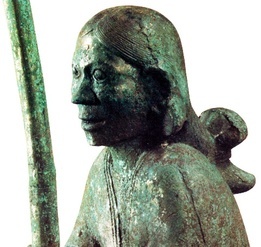 Detail of a bronze statue of a maid holding a parasol, from the Dian Kingdom 滇國, a client state to the Han Dynasty in mountainous southwest, now Yunan.First century BCE.